J. Sterling Morton High School District 201 is home to one of the ten finalists for the 2017 Illinois Teacher of the Year Award presented by the Illinois State Board of Education (ISBE). The annual educator recognition program acknowledges the contributions and accomplishments of educators and school personnel throughout the state. After reviewing more than 250 entries, a J. S. Morton H. S. District 201 Spanish Language teacher is a contender for the prestigious award after years of setting and surpassing academic records within the school district’s department. 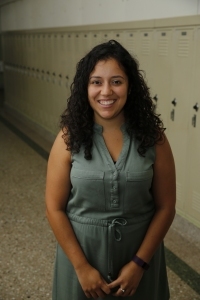 Under the instruction of Advanced Placement (AP) teacher Elizabeth Mendoza, the school saw a 100 percent pass rate among AP Spanish Exam takers for two consecutive years. During the second year, the school also saw an increase in the number of students earning 4s and 5s. The positive results translated to more AP Spanish Language students earning college credit at any public college or university. “These results do not happen by accident. She makes herself available before and after school, and on Saturdays, to provide extra help and practice for her students in preparation for the AP exam. She helps her students to appreciate their bilingualism as an asset, promoting the Seal of Biliteracy as a mark of distinction that affords exceptional opportunities for college and careers,” according to Jeffry Pesek, J. S. Morton Board of Education President. The 2017 Illinois Teacher of the Year will be announced during the “Those Who Excel” banquet on Saturday, Oct. 22, at the Bloomington-Normal Marriott Hotel and Conference Center in Normal. The awardee will represent Illinois at NASA Space Camp in Huntsville, Ala., and in the Council of Chief State School Officers’ National Teacher of the Year Program.